ABOVE: Nobody's dream landscape -- across a sea of asphalt, a McMansion roof peeks over inaccessible retail outbuildings. REMINDER: Please mark your calendar for January 24th, 6-8pm, and plan to attend the Comprehensive Outdoor Recreation Plan Open House so you can voice your concerns regarding making Franklin a competitive community that is travel-friendly for children, the elderly, and differently abled persons. Here’s what Generation Y doesn’t want: formal living rooms, soaker bathtubs, dependence on a car. Something to keep in mind here in Franklin, as we struggle to create a wider and deeper tax base as well as attract young talent. However, as I noted in yesterday's post, we're still mired in outdated notions about trails and sidewalks as mere "recreational opportunities" when they are in fact crucial infrastructure. Read the rest at No McMansions for Millennials - Developments - WSJ: ""
Coming off of a bit of a work-enforced break from blogging, I stumbled upon a new resource out of Chicago. It's hard to argue with the title of Jason Tinkey's blog -- The Planner's Dream Gone Wrong -- and, given the epic Packers-Bears struggle scheduled for this coming Sunday, it's as good a time as any to engage a flatlander in a friendly manner before kickoff. Jason discusses American provincialism in this particular blog entry, quoting Barcelona Deputy Mayor Jordi William Carnes making the observation that "America is important to the rest of world, but spends too much time looking inward." This provincial attitude reared its tiny head again this past week, when Wisconsin Governor Scott K. Walker (that "K" is crucial to avoid denigrating the proper Scott Walker) slammed Illinois for it's tax hike and invited businesses to relocate to his state. As James Warren wrote, this shows a lack of a broader vision on Walker's part. He's playing for votes within his own little fiefdom, seemingly oblivious to the fact that if Chicago's economy were to fail, Wisconsin's would go down right beside it. As much as I love our neighbors to the north, Milwaukee does not have the transportation infrastructure necessary to link it to a global marketplace. This is the same guy, mind you, who basically ran for office on his opposition to high-speed rail, which would be one of the best possible assets in building a regional economy. So allow me to state for the record my philosophy of how the future is aligned: neighborhood - city - region - planet. Note that "county", "state" and "nation" do not exist. These are eighteenth-century constructs that serve little useful purpose in a connected, digital global economy. The hard question is asking what it will take to achieve this in these "United" States. No politician has ever voted themselves out of a job, and yet a thorough realignment of local and federal governance is necessary. Industrialized Europe had to be more or less leveled in World War II for the stakeholders to recognize the value of cross-border cooperation and a free exchange of people and ideas. I certainly hope we don't need such a serious jolt. Wisconsin and Illinois, despite their football-based loathing, have too many issues which demand cooperation. And you can add Michigan, Ohio, Minnesota, Pennsylvania, New York and Ontario to that mix, as well. In coming decades, stewardship of the Great Lakes will become crucial to the region and to the world. Transportation linkages already radiate from Chicago like an octopus, in a common region with common concerns, these absolutely must be brought up to speed with the rest of the developed world. There is really no other option. The incoming governor of Wisconsin chose ideology and bald-faced patronage over common long-term fiscal sense. No train for us. The citizens of Wisconsin will be paying Scott Walker's benefactors in the asphalt spreading business for years and years to come. Bonus points: Did you know asphalt uses petroleum? City engineering by "gut": "Let's live on the edge and BUILD THE FOUR-LANER!﻿"
Fred: Your "Let's widen College Avenue" argument doesn't make a lot of sense, frankly, unless you are merely looking for a cudgel with which to hammer the mayor. And, any cudgel will do, right? You ask: Why would the mayor and city officials argue for Contest Sensitive Design when a road is being built through our community? But - what's that? Traffic can DECREASE? Guess what - the engineers don't account for that in their forecasts. They are all about BUILDING IT UP. If traffic rates go up +.05 in a year, they tend to keep adding the same increase every year. Let's apply engineer-style traffic analysis: My daughter grew 1.5 inches in the past year. At this rate, she'll be over 9 feet tall by the time she's my age. Your stance sees to be "gut instinct" against years of traffic studies NOT DONE BY ROAD BUILDERS that show widening roads actually INCREASES traffic and congestion (it's called "induced traffic"); and that creating alternative travel options (bike and ped) DECREASES traffic and congestion. You also proceed from a FORTUNATE standpoint: You and your kids perhaps can (or will) drive. How about a bit of empathy for those of us who want to create an environment of moderate independent travel for the elderly of differently-abled? I can tell you for CERTAIN that I will not live in a community where my son cannot walk a few blocks to get on a bus or visit a friend. Interesting statistic: Motor vehicle crashes are the leading cause of death for 15- to 20- year-olds. Franklin's 16-to-20 year-olds have NO OPTION but to drive. Do you know that a pedestrian or bikers chance of death jumps from 45% to 85% when the speed limit jumps from a sane, residential 30 MPH to the Franklin-standard (and enforced by engineering) 40 MPH? A 27th street public transit hub (i.e. better than the spotty bus service currently available) is a logical next step. The average American who lives in an area that's walkable and has transit spends only 9% of their income on transportation, while a person living in an area that requires driving spends more than 25%. College Ave. can feed bikes and pedestrians to a public transit hub IF ACCOMMODATIONS ARE MADE FOR THEM NOW. Of pedestrians killed in 2007 and 2008, more than 50% died on arterial roadways, typically designed to be wide and fast (ala College Ave). Roads like these are built to move cars and too often do not have meet the needs of pedestrian or bicyclist safety. You can dismiss safety, induced congestion, and mobility for the differently-abled and elderly. But how about ECONOMIC DEVELOPMENT? Lost in the rhetoric and misstatements about the Madison-Milwaukee train is that it is a segment of a network of trains connecting Chicago and the Twin Cities, and eventually a portion of a truly national rail system. It makes no sense to excise Wisconsin from the line. Check out this map of the Midwest plan, and remember that it will connect to routes service other regions, too. It will make the state an inaccessible economic backwater. Short-to-medium length trips are not always available by air; often airports are distant from central business districts or other job centers, and last-minute air travel can be pricey. And many people - - the elderly, the young - - do not drive, do not own a car or have access to one. Rail opponents, often suburbanites, need to realize that not everyone has a minivan. The rail system is intended to fill in these gaps, providing connections among businesses, universities and tourist destinations not easily served by aviation. Trains also offer a working environment not replicable inside a car. Modern trains are fast, wi-fi-equipped, comfortable and imminently practical. A new national rail network makes an infrastructure investment that fills a need, puts people to work and was to be made available in Wisconsin at no construction cost, and an annual operating charge statewide of about $60,000 a month. A bargain, as I said a few days ago. As the scribe Wisconsin State Journal philosopher scribe used to say, "What could be more fairer?" ﻿It cost around four million dollars to refurbish the station. If you’re thinking that there’s no way the cash-strapped Chicago Transit Authority could afford that, you are right: it was funded with private money, by the Apple corporation, in conjunction with the company’s construction of a new retail store on adjacent property. 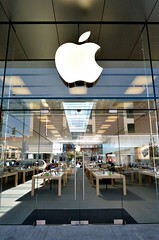 “This is not a company that leaves much to chance and there was no way the sales gurus in Cupertino were going to let a dungeon-like transit stop present the first impression of their sleek and glassy store. “Remember, Apple sells an experience as much as it sells products. Apple also built the plaza in between the North/Clybourn transit station and its new store, which opened in late October. Car-loving Charlotte, N.C., home to strip malls and suburban sprawl, did everything right when putting in place its new light-rail transit system called the Lynx in 2007. The result: a ridership that doubled predictions, and an unexpected public health study that may be the first in proving that the built environment causes obesity. Riding the rails can leave users an average of 6.5 pounds lighter than others, and 81 percent less likely to become obese over time, according to the study, published in the American Journal of Preventive Medicine. Before this study, it was difficult to say for certain whether the features of the built environment, such as sprawl and miles of roadway, are directly responsible for obesity and related illness such as cardiovascular diseases and diabetes. In its first year, at the peak of the gasoline price rise, Charlotte's Lynx saw about 18,100 riders, which was double the number expected, said Robert Stokes, researcher at University of Pennsylvania's department of culture and communication, and co-author of the study. The numbers have maintained. The city did all the right things when putting in place the light-rail system, Stokes said. It chose to put the line close to places where people lived, which increases ridership, according to studies. The corridor stretches 9.6 miles and has 15 stops. Charlotte also changed its zoning laws to allow development closer to rail stations, and a greater concentration of units. It was a policy change, said Stokes. Since World War II, zoning laws in the nation promoted a separation between commercial, residential and recreational land use in the built environment, leading to more sedentary lifestyles. About half of all Americans do not get enough physical activity to promote health, and about 25 percent do not get any exercise at all, according to the Centers for Disease Control and Prevention's 2007 statistics. Another conservative voice in the wilderness: "Wake up to the economic benefits of high-speed rail"
Following an excerpt from the BizTimes column, I've posted a comment by Gateway to Milwaukee's Tom Rave in full. All too often, leaders of established businesses act like horses pulling carriages in New York City’s Central Park, wearing blinders to avoid distractions. Which brings me, a political independent, to the narrow thinking of Wisconsin’s Republican Gubernatorial candidates on high-speed rail transit connecting Milwaukee, Madison, Chicago and, eventually, Minneapolis, St. Paul. The two candidates are loudly against the investment at the federal and state levels, while their Democratic opponent favors this investment. The Republican candidates, along with other opponents of high-speed rail, argue that no Wisconsinite is going to take the train to go see his mother or make a client visit in another city, because cars are faster and more convenient. As a result, the trains will be a financial disaster. These critics are thinking about the future with eyes on past and current behavior. They are judging the behavior of the current workforce, not thinking about those who elected to not to live in Wisconsin or how our workforce will change as the baby boom cohort retires. As a result, critics are missing the entire argument for why trains are essential to Wisconsin’s future. Wake up Scott Walker and Mark Neumann. Beyond the close to $1 billion of needed economic stimulus, the trains will make our two largest metro areas a more attractive location to live, work, and play, drawing outsiders to our region and slowing if not reversing the “brain drain” that is worrying the majority of people in the state. It is true that the Midwest Rail System, of which the Milwaukee to Madison expansion is a part, will not be "world class" high speed. That would be much more expensive, such as the system authrorized by the voters in California, for example. Yet Amtrak between Milwaukee and Chicago is not "high speed" but is being chosen by more and more riders, even without high gasoline prices currently. Plans for the Midwest Rail System do call for higher speeds than the current ones. Instead of focusing just on Milwaukee to Madison, as Kay Plantes suggests we need to look at the longer-term bigger picture about Wisconsin being competitive. Here's an interesting anecdote. A local entrepreneur had a business plan and a need for $5 million in capital. Potential investors from Seattle were very interested, willing to invest $2.5 million and paid for research on greater Milwaukee. Their strong preference was to start the company in Chicago, possibly start it in Madison, but they had no interest in Milwaukee. The plan called for hiring 60 young IT and creative design professionals in 120 days and they did not want to take the risk of doing so in Milwaukee. A primary reason was the concern about transportation for these young people - generations X & Y - around Milwaukee and even between Chicago and Milwaukee (the KRM would have been a solution). So the business ultimately started in Chicago - 200 feet from a train station. The basic point is that because southeast Wisconsin is inadequate in its overall transportation structure versus other metropolitan areas, the start-up capital and the jobs went somewhere else. It is interesting to see that the mayor of St. Paul, MN, a commissioner of Ramsey County, a mayor of an eastern suburb of the Twin Cities, a MN state legislator, the MN DOT and others are collaborating to do a study, funded by $1.4 million of federal funds, to decide what is the optimal combination of transportation modes along the I-94 corridor between the Twin Cities and Eau Claire, which is where they anticipate that the Midwest Rail System will run. The Twin Cities is growing, in spite of also having high taxes - we are not. But they are also taking a collaborative approach in looking at the future. In looking at Wisconsin, we need to develop a collaborative plan about future transportation needs so that we will be economically competitive. Otherwise we will just continue to have disparate and emotion-filled arguments about different and uncoordinated alternatives as we do now, where decisions seem to be arbitrarily and independently made. By that I'm referring to the current unconnected discussions the Midwest Rail expansion, the downtown Milwaukee streetcar, the shrinking Mke Co Transit System and the foundering Southeast Wisconsin Regional Transit Authority. A strong collaboration of business, government and political leadership with a shared vision toward a long-term goal of economic competitiveness are needed. Is there an opportunity for those running for office?